Color management is the concept that scares a lot of novices resulting in faulty color rendition and even more frustration with color management. This section aims to offer some no-hassle guidelines for achieving adequate results. But first, the nerd bit. For digital imaging, color management is the collection of techniques applied in order to obtain consistent color reproduction across all the devices. Take any color in the horseshoe diagram. It will always be the same no matter what name you attribute to it because it will be situated in the same point in the diagram, in other words it will have the same xy coordinates. Now when you define a color space within the horseshoe diagram, you identify the colors in that color space by a row of numbers. These numbers represent the proportion of each primary color that is needed to obtain the color in question and are equivalent to the color's ‘name' in that space. Because each color space will have its own primaries, that same color will have different ‘names' in each space. There will be cases when a color (C) will be within the gamut of color space A but not in that of space B. It will have no ‘name' in color space B. So what becomes of color C when we absolutely need to work in color space C? In practical photography this business of colors being outside the gamut of the ‘final' space happens quite frequently actually. And the reason for this is that the different pieces of hardware have different gamuts, usually based on their constructive principles. The issue of most interest to photographers when it comes to color management is to be able to make a picture on the screen and the printout of the same picture look as close to identical as possible. 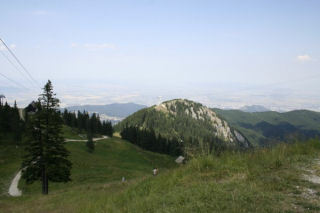 The software converts the image to the printer color space for printing. As can easily be seen, ‘the software' does a lot of converting and to do it right it needs to know what the potential of each device are in terms of color representation (i.e. gamut etc). These capabilities are stored in the device specific ICC profiles (files that represent the device's gamut and other specific parameters such as gamma for monitors). Device- independent ICC (by the way this stands for the International Color Consortium) profiles also exist, describing in this case reference color spaces such as sRGB or AdobeRGB. The routines responsible for color management are called CMM - color matching module (or engine). CMMs perform basically the same actions, but each manufacturer names its own differently. Adobe's CMM is called ACE – Adobe Color Engine; the one from Microsoft is named ICM, standing for Image Color Management, now at version 2.0; Apple makes ColorSync. Of course, a myriad of alternative color matching modules exist from various publishers. The CMM uses the ICC profiles of various devices to perform gamut mapping -- the process through which the colors of an image are translated from the source color space to the destination) color space. 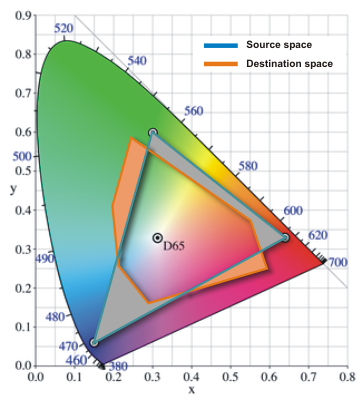 In order for gamut mapping to work, the two color spaces need to have something in common and that something is the reference color space also known as a profile connection space (PCS). The PCS is usually CIELAB but can also be CIEXYZ. (How's that for an acronym tirade?) The reference color space is larger than any of the two spaces involved in the conversion and it acts as a temporary unique system coordinates. In the ‘make my prints look like my screen' situation described before, the profiles of the printer and the monitor are both used to achieve consistent results. It is the job of the CMM to ensure that the colors present in the working space have a correspondent on both media (and that the correspondents are close enough in appearance on both the printout and the screen). 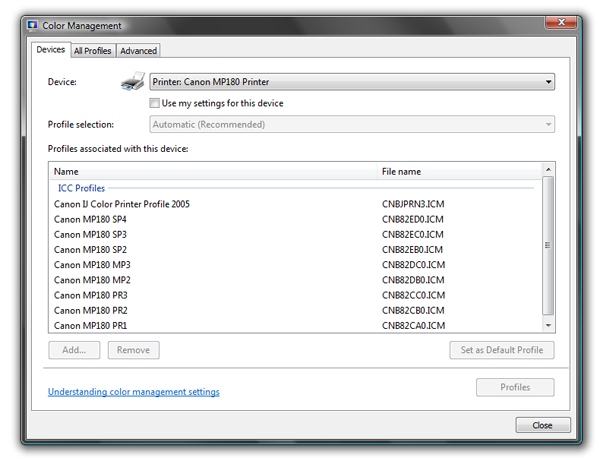 The issues that color management solves arise precisely from the fact that devices of different types tend to have differently ‘shaped' and sized gamuts when represented in the PCS. If color management is not performed (device ICC profiles are not taken into account), results may range from slightly color shifted to unusable, depending on the relative shape and size of the two spaces. An example of two arbitrary color spaces is shown below, with shaded portions of the diagram illustrating the colors that can be represented in one space but not in the other, respectively. Saturation rendering intent (called Graphic by Microsoft) is usually used in presentations and business graphics to ensure that colorful charts and graphs remain pleasant to look at, by mapping primaries in the source space to primaries in the destination space. This has the effect of altering the color hue (obvious) but possibly also lightness and is particularly helpful in eliminating annoying dithering effects for colors that would have otherwise been very close but not 100% saturated in the destination space. Absolute colorimetric (Microsoft's name is Match). Colors that fall within the gamut of both spaces are preserved, while colors in the source space that fall outside the destination space are clipped to the closest reproducible color. 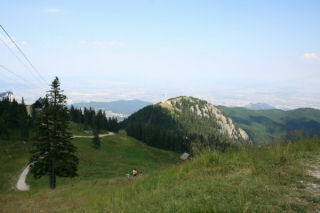 This rendering intent does not preserve the white point, introducing a distinctive color tint in the converted image and thus not being of real use to photographers. Clipping hues makes this process irreversible. Relative colorimetric (Proof) is quite similar to absolute colorimetric in that colors common to the two spaces are mapped one-to-one and those outside the destination's gamut are clipped to the nearest in-gamut color, but the white point of the image is also preserved. As this intent implies the clipping of saturated colors in the source space, it also is irreversible. 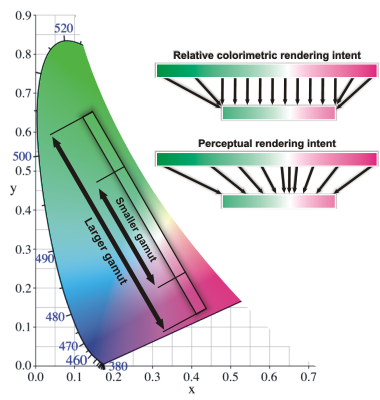 Perceptual (Picture) is the most widely used rendering intent. Regardless of the sizes and shapes of the two color spaces, the source's gamut is stretched (either way) to cover the destination space (and no more) completely. This transformation is in theory reversible, as no information is lost along the edges, but due to the finite granularity of the two color spaces, a better result can be obtained if the color resolution is increased (to 16 bits per channel) for both the direct and the reverse conversion and no going back to lower color resolution between conversion is performed. Having established that Relative Colorimetric and Perceptual are the two rendering intents most appropriate for digital photography workflows, we shall now discuss which one is more suited for what purpose. First rule of thumb, if you want to be safe, use perceptual. The relationship between the colors will still be there, but on the downside the visual effect may not be that great. You might lose (or gain) contrast, saturation and worse still, in some hues more than in others. As all images are different, for best results each should be considered in turn. The important distinction here is to take into account the colors actually present in the image, not the size of the source space itself. Think of the subspace occupied in their color space by the colors the image uses. If this subspace fits entirely or almost totally in the destination space, go with the relative colorimetric intent. In the diagram above, you would be in the case where all or most of the lines are parallel and little or no color information will be lost through clipping. This is also the case when converting to a color space that completely surrounds the soruce space. However if there are a lot of colors in the image that cannot be reproduced in the destination space, using perceptual intent is the better bet. Working with relative colorimetric if a significant part of the color distribution in the source falls out of the destination's gamut can destroy detail (irreversibly) and can lead to patches of solid color where subtle detail once was. The good news is that most of the color management is done automatically observing color space conversion rules that you can set. This is usually done by using the ‘Color Management' or similar menu item from your preferred image handling application, and setting the needed intent. 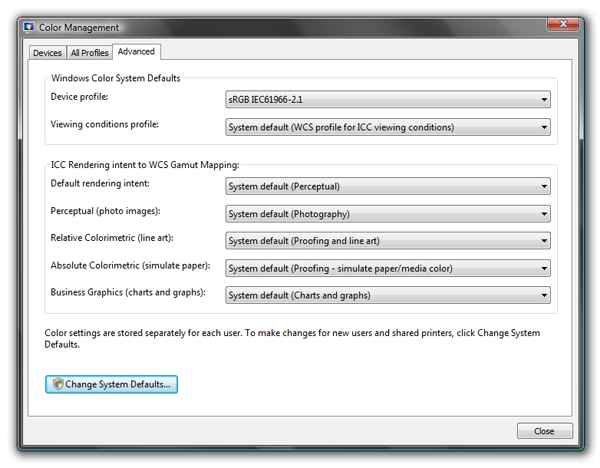 Windows Vista has a basic color management setup window for setting the system defaults. It can be reached from Control Panel -> Hardware and Sound -> Color Management. Attach device-specific profiles to the various output devices. In Photoshop CS2, the color management options are accessed via Edit->Color Setting->More Options. The following example, of questionable artistic value but of undeniable natural beauty, shows the consequences of (mis-) using rendering intents. In this case, the source space was AdobeRGB and the destination the smaller-gamut sRGB. This is quite a typical conversion in the not recommendable event of importing files shot in AdobeRGB to your imaging processing software that uses sRGB as a working color space. The same things happen when converting from the working space to the printer color space and the chosen rendering intent is Perceptual. The point is that in this example, while not catastrophic, the differences can be seen with the naked eye. In real life you could end up with sub-par results if the rendering intent does not fit the image. The image on the left (A) was shot in AdobeRGB and converted to sRGB using the default (perceptual) rendering intent. The one on the right (B) was shot in sRGB and was left unmodified. At this moment both images share the same sRGB color space and your browser probably uses sRGB too, so the only difference between them (apart from them being different shots) is that image (B) has more saturated greens and cyans. But to achieve more saturated greens and cyans is precisely why you would normally ditch sRGB in favor of AdobeRGB as an image color space. So what is wrong with the images? In fact nothing is. By using the Perceptual rendering intent in the conversion, the colors, especially in the green-cyan area were squished so they fitted in the smaller color space. The sRGB image (B) has quite saturated shades of green and cyan but not very saturated, or else they would not fit in the sRGB gamut. And the fact that you are seeing them on screen is proof that they do fit. 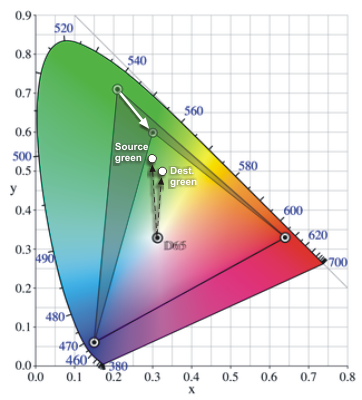 What is a quite saturated green in sRGB is only moderately saturated in AdobeRGB. By squishing AdobeRGB into sRGB, that moderate green becomes even less saturated (and again this applies to all the colors in the blue-cyan-green range), hence the appearance of image (A). To summarize, this is a classic example of the results you get when using Perceptual rendering intent for images the colors of which would quite comfortably fit in the destination gamut as they are. In cases like this, relative colorimetric is the way to go. Referring back to the example above, the original AdobeRGB image converted to sRGB using relative colorimetric would be indistinguishable from the image on the right (the conversion would faithfully preserve the colors of the original).